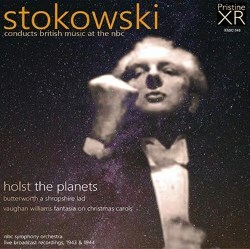 Stokowski’s NBC Symphony The Planets has appeared before, most prominently on Cala’s much-remembered series of discs devoted to his performances (CACD0526), where it was very differently coupled. Where this differs is the source material which appears to be different - a near mint set of acetates. The brief opening radio introduction is retained for Pristine’s release and then we’re into the February 1943 performance. He had first conducted the work in memoriam for Holst in Philadelphia in 1934 and returned to it in 1941 with the NBC. He recorded it commercially in stereo in 1956 with the Los Angeles Philharmonic and returned to it in London in 1963. These details are courtesy of Edward Johnson’s illuminating notes in the booklet. The very clean undistracting surfaces of the acetates allow one to appreciate Stokowski’s fast tempi for Mercury, Jupiter and Uranus; he takes pretty much Holstian tempi for these three movements, judged especially by Holst’s own 1926 electric recording, though he was hardly a slouch in the slightly earlier acoustic set. He doesn’t replicate the visceral Holst tempi for Mars or Venus. Fortunately, with clean surfaces comes vivid frequency response for the time and place, and the XR work seems to have filled out Studio 8H somewhat, to advantage. Stoky encourages some voluptuous portamenti in Mercury and there’s a luscious solo from the concertmaster; more vegetarian listeners than I might find the end of this movement somewhat sentimentalised. The orchestra sounds very much moulded to Stokowski’s will, both dramatically and sonically, throughout this whole performance and only the very greatest conductors achieve this. But for muffly percussion Uranus could stand as a sonic spectacular, though the effect of Neptune is somewhat odd and jarring in its valedictory nature. The all-British programme continues with the performance, a year later, of George Butterworth’s A Shropshire Lad. This is a passionately declamatory reading, once again irradiated by succulent slides and striking wind solos; Stoky’s rubati are equally prominent. There’s nothing ramrod-backed, emotionally speaking, about this. Finally, there is VW’s Fantasia on Christmas Carols, an appropriate choice for 14 December 1943 and warmly and sympathetically done. Pristine’s Stokowski series keeps up the good work with this well-programmed trio of recordings.